Beautiful two-story home in West Austin! Close to downtown (15-20 mins), private schools, and employers. Oversized lot backs up to greenbelt and features lovely patio with outdoor kitchen. Great for your next BBQ! 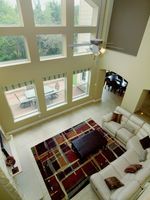 Spacious family room with gorgeous two-story limestone fireplace. Total of 5 bedrooms with one bedroom on main floor plus a study. Kitchen opens to family room and has granite countertops with tile backsplash. Hardwoods/laminate and tile throughout.